As the bell rings at 2:40 p.m., senior Sydney Heitmann rushes to the girl’s locker room to be able to change and be out by the pool before practice starts. This is what she is used to, always being on the go. Growing up, Heitmann and her older brother had a pool in their backyard, so Heitmann has been swimming for recreation since she was two years old. Heitmann mentioned about how her mother wanted to make sure she knew how to swim, and how to swim well. “It is just one of the survival skills,” Heitmann said. Taking her skills, she later put them to use and joined the swim team her seventh grade year. Since then she has been swimming and working toward improving her herself while helping others, and being the best she can be. 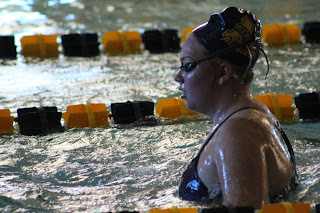 “Swimming with Sydney is great, she’s always pushing me to beat Noah,,” senior Hunter Dickerson said. While there is many positives that come from swimming as Heitmann claims, there is also some downfall. From constantly being in the water, it dries out her skin, and all the chlorine damages her hair. Despite those effects, Heitmann says it’s well worth it. Even though this is Heitmann’s last season swimming she plans to continue to improve herself and help improve others. “Make sure you love what you do, because if you don’t, you’ll regret, and only do what makes you happy in the end,” Heitmann said.